Facing electricity breakdown often? 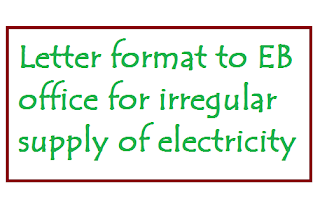 Want to make a complaint by forwarding the issue to electricity board? 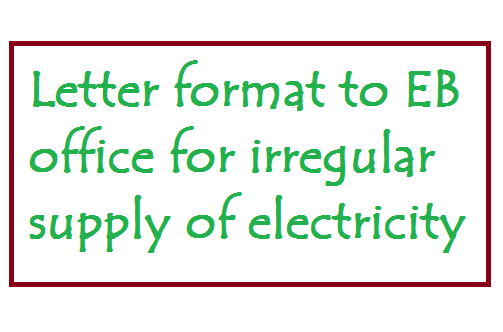 Here is a sample / model letter format that can be used for writing your issue about shortage of electricity supply or letter on frequent breakdown of electricity. Learn more from the article written below. I am living in the above address. In my area, the supply of electricity is often disturbed due to various reasons. Our area people face a lot of difficulty as the electricity is unexpectedly cut down. So hereby I request you take up this issue and make the power supply in proper way. I hope you will take immediate action on this. Note: You have to use your own particulars at the places where ever required in the letter format provided above. Use this sample format as a model only. You may need to specify more details based on your complaint / issue. Thanks for understanding! You may keep sharing this letter to your friends or relatives who needed a sample format of letter.